Explore the Creativity 3Mâ&#x201E;˘ DI-NOCâ&#x201E;˘ Architectural Finishes can be applied to a wide variety of surface materials, allowing infinite creativity. With the addition of 225 new patterns that incorporate the latest trends, more than 1,000 different designs are now available. The new Matte Series utilizes the latest technology available, including Solid Color, with deep, rich colors, Dry Wood, with the appearance of natural wood, and Industrial Texture, with an industrial and an organic feel. The diverse selection of additional unique designs maximizes interior design possibilities and includes Oxidized Metal, which simulates an anodized coating, and Textile, with a delicate woven texture. Experience greater design freedom with DI-NOC architectural finishes. Do more with your designs. Matte Coating Technology The new Matte Series utilizes the latest technology available. With a new state of the art matte surface, the Matte Series offers realistic texture by converting incident light into diffuse reflection and suppressing specular reflection. This series also provides fingerprint resistance. Explore the new world of design possibilities with 3Mâ&#x20AC;&#x2122;s Matte Series. Experience the difference in texture between the existing series and new Matte Series. AR Series abrasion-resistant patterns are designed for high traffic applications and maintain a beautiful appearance. Please see page 48 for additional AR Series patterns. Technical Information DI-NOC Series Selection It is important to consider the intended use when selecting DI-NOC patterns. 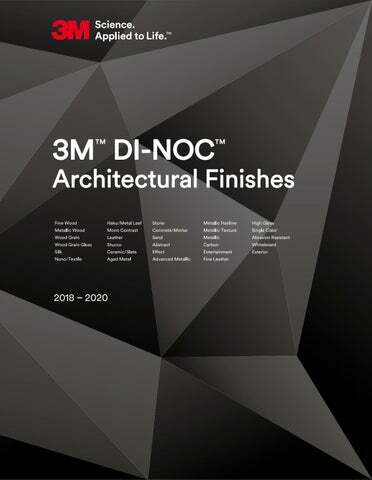 Please refer to the most up-to-date 3M™ DI-NOC™ Architectural Finishes Technical Data Sheet and Installation Guide, which can be found by visiting 3M.com/AMD. You may also contact your 3M Sales Representative for additional information. Horizontal Print Series 3M™ DI-NOC™ Architectural Finishes Fine Wood (FW) and Wood Grain (WG) Series include horizontal pattern options, which simplify the use of horizontal wood grains by changing the print direction. 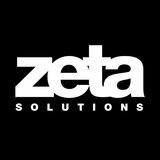 *Product applied to an aluminum plate. Contaminant was in contact with the film surface for 24 hours and then removed using water or mild detergent. Diluted Isopropyl Alcohol may be used for more difficult stains. Results may vary. Regular cleaning will help maintain the appearance of the finish. Use mild detergent and water, and a soft cloth or sponge without abrasives. For difficult stains, spot clean with a diluted Isopropyl Alcohol solution and a soft cloth. Avoid using strong solvents or detergents that are either highly alkaline (pH>11) or acidic (pH<3). Do not use ammonia, chlorine, or strong organic-based cleaning products, polishing or cleaning compound, hard-bristle brushes or electric polishing tools and wipe gently. The values in these tables are typical, and are based on test data deemed reliable but are not warranted. See the 3M™ DI-NOC™ Architectural Finishes Installation Guide for additional information. Bubbles may appear under film due to outgassing if plastic substrate is not fully cured before application. 2 If DI-NOC is wrapped and overlapped around edges, use of an adhesion promoter is highly recommended due to additional stress from wrapping DI-NOC. 3 Sealer was wiped with Isopropyl alcohol to improve adhesion. Adhesion was tested using a spring scale per the 3M™ DI-NOC™ Architectural Finishes Installation Guide and passed at 800–1,000 g/in. Comply™ Adhesive Technology Comply Adhesive has air-release channels that allow trapped air bubbles to escape during application. Dry application only.